Dried black currants are a powerhouse of nutrition. They are low-fat, cholesterol-free and high-protein, with each cup of dried currants containing 5.88 grams of protein. Dried currants are also an excellent source of nutrients that are essential for health, including dietary fibre, copper, manganese and potassium. 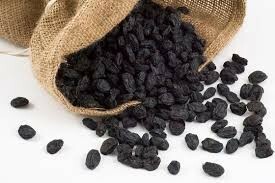 Prepared from the small, berry-like fruit native to Europe, dried black currents are often used as a substitute for raisins, dates or prunes in baked goods. They have a tart flavour that pairs well with cream and with sweeter fruits like raspberries and cherries. Adults over 19 years old need 900 micrograms of copper each day. Dried black currants provide 674 micrograms of copper in every cup, or about 75 percent of an adult's required daily intake. Copper is used by the body to synthesize collagen and to promote the absorption of iron. It is also necessary for energy metabolism and to inhibit free radical compounds from damaging cellular tissue and DNA. Adequate copper intake may lower your chances of developing osteoporosis, osteoarthritis, thyroid problems and anaemia.